Over 350 pages packed with wonderful information and pictures - many in color! This is a must for the old time radio book shelf in your personal library. Great interviews and well researched, this is simply the best book I've seen on Kay Kyser and in my opinion long overdue! The book covers Kay's early years, Hollywood films, Camp Shows, his later years, orchestra discography and filmography. Kay Kyser was one of the most outrageous, over the top performers of the whole swing era. From the late 1930s to the late 1940s, he had eleven number one records and thirty-five top tens. Songs like "Three Little Fishies," Who Wouldn't Love You," "Jingle, Jangle, Jingle," and "Praise The Lord and Pass The Ammunition" have stayed in America's hearts for decades. He kept his NBC radio quiz/music show, Kay Kyser's College Of Musical Knowledge, a favorite with swing fans for eleven years, and made seven feature films and appeared in two others. Some of his costars included John Barrymore, Lucille Ball, Mickey Rooney, Boris Karloff, Jane Wyman, and Bela Lugosi. Kyser's radio gang consisted of Ginny Simms, Harry Babbitt, Sully Mason, Ish Kabibble (Merwyn Bogue), and Georgia Carroll, whom he would marry. His orchestra was greatly admired, and swing legend Glenn Miller was quoted as saying the only bandleader he envied was Kay Kyser, who performed over 1800 shows for WW2 personnel. Yes, James King Kern Kyser was a lightning rod to audiences onstage, but a very private man with many contradictions, offstage. 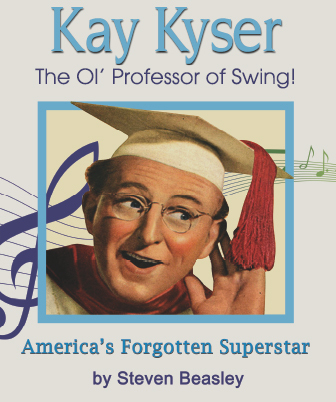 Kay Kyser-The Ol' Professor of Swing! America's Forgotten Superstar is the first published, full lenth biography of the man and his band that set swing music on its ear - then disappeared! Chock full of rare photos and interviews, it's the warm, yet dramatic story of the beloved entertainer who hid a debilitating illness from his fans, quit show biz unannounced at his peak, and went home again to his beloved North Carolina, where he began a new life as statesman and fundraiser and resurfaced thirty years later as President of the Worldwide Church of Christian Science. He refused all interviews regarding his band days, and militantly preserved his privacy. How could one who accomplished so much be forgotten today? Some of it was his own doing, and some...well, read on! Numerous magazine articles, web-sites and reference guides have reprinted the same errors over the past two decades. The authors of this book have spent more than a decade researching this subject through various archival materials belonging to the family relatives who were responsible for the formation of the series. No matter what you have read in the past, this book is certain to correct all the myths and mistakes that continue to get reprinted.